Combine flour and baking soda. Add eggs, apple sauce, sugar, vanilla and buttermilk. Mix until well blended, but do not over mix. Pour ¾ c. batter into 6 or 7, 9” round cake pans (depending on how much batter you have and how well you scrape the bowl) and use anodized aluminum, so as not to burn the edges. Bake at 350 degrees for 15-18 minutes. Cool on wire racks while making fudge frosting. Melt butter in sauce pan over medium heat without boiling. Add sugar, cocoa, vanilla and evaporated milk. As soon as it comes to a boil, time for five minutes (ONLY five minutes) and then immediately remove from heat. Ice your cake layers immediately or the frosting will harden into fudge, rendering it impossible to spread. Serve warm, if possible, and you have the most decadent, Southern tradition that will melt in your mouth and be remembered for generations to come! About Angela McKeller: Chef, Kookbook Author, Couture Aprons and Host of “Kick Back and Kook!”, Angela McKeller appeared in many tv shows and her recipes have been featured on numerous websites. Check out her radio show and website for more delicious recipes! Chocolate Manufacturers – Guide for Chocoholics – Bake Me A Wish! We featured Bake Me A Wish! in our Chocolate Manufacturers – Guide for Chocoholics. Founded in 2004, Bake Me A Wish! is a premiere on-line bakery offering handmade cakes based on award-winning family recipes. Perfected by master pastry chefs and using the freshest and most decadent ingredients available, the cakes are priced between $20 and $66, including shipping. The fresh and mouth-watering delights arrive beautifully packaged in a customized box with a personal note. Bake Me A Wish! has unveiled its Holiday Gift Cakes 2009 . Now you can celebrate the season by sending delicious cakes to your family, friends, clients and colleagues! All of the cakes are decorated with an imported Belgian chocolate plaque, a “season’s greetings” salutation and are specially packaged in an elegant gift box to guarantee freshness. For corporate clients, Bake Me A Wish includes a customized gift card with the company’s logo accompanied by a personal message of gratitude. Best of all, Bake Me A Wish! cakes are both kosher and certified by Chof-K, perfect for this holiday gift giving season. A moist golden cake layered with apples, cinnamon and topped with a layer of thick, delicious, tender streusel. Then, a layer of creamy caramel is drizzled on top. 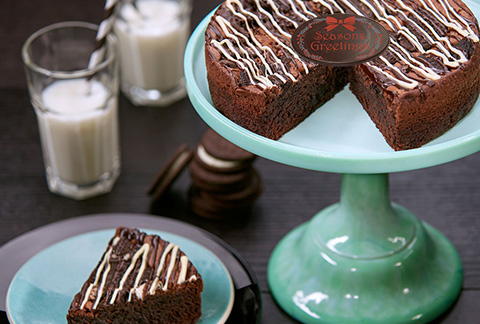 A moist and fudgy brownie cake topped with crunchy chocolate sandwich cookie pieces . Topped with a festive drizzle of white chocolate. A moist and fudgy brownie cake enrobed with mouth-watering chocolate chip and cinnamon oat streusel, with ribbons of dark chocolate glaze. AS SEEN ON RACHEL RAY! To order your gourmet cake gift or to inquire about Bake Me A Wish’s corporate loyalty programs, please call 888-987-9474. Swiss Maid Fudge of Wisconsin Dells, WI specializes in decadent handmade from scratch candy, just like Grandma used to make! Swiss Maid Fudge Candy Store has delighted Midwesterners for over 45 years with its decadent and delicious confectionary treats and now their candy is available for everyone to enjoy coast to coast. Owner Jane Heller grew up in the candy business. Their classic milk and dark chocolate fudge is to die for but there’s plenty of unusual fudge flavors that are just as inviting such as seasonal favorites – Creamy Dreamsicle, Smores, Cookie Dough, Butter Pecan, Creamy Strawberry and Amaretto. Each day the staff is hard at working creating these and dozens of other sweet creations including mouth watering chocolate bars, caramels, salt water taffy, chocolate dipped angel food cake and brittles…to name a few. Each recipe is made the European way using copper kettles and cooking over open-fired cast iron stoves. All of their homemade candy is created fresh daily in their kitchen using the finest ingredients and hand mixed on special confectionary tables. Made without artificial preservatives, artisanal candy makers at Swiss Maid Fudge cook, creatively package, and ship your order for you fresh – right from their kitchen! Since 1962 her family has been keeping the locals and tourists happy with a delicious variety of fudges and other amazing treats that are now available nationwide at www.swissmaidfudge.com. For the next month or so, we are going to feature some of the best Chocolate manufacturers, most of them from the US and many of which you may know already. Some of them are from other countries but definitely worth mentioning. If you like to read this kind of stuff then please follow us on twitter @1happyblogger and join us on Facebook!